As mentioned in previous entries, I have explained that I have been going deep with birds and cupcakes. Well, I have more news. I found out that these birds are only eating the icing and not the cupcake part. They aren’t even sparrows, as I have noted before. They are actually “Yellow-rumped Warblers”. I did some research about them on wikipedia and a bird-watching site, and nowhere, does it say that they eat anything besides insects, that is, except for the myrtle-wax berries that they eat on the east coast. There, these birds are called “Myrtle Warblers”. There are 3 other names given to them as well, which varies on location. During the winter time, these birds migrate hundreds of miles, which I think is quite impressive. They have such small wings, but yet they are able to travel so far with them. I am not sure if they traveled here to stay during winter, or if they are here all year-round. They seem to be content with the icing they are eating. Over the past few weeks, the birds have been increasing by the numbers. I don’t know how long I can keep giving them cupcakes, without my mom or my siblings finding out. It is strange that these warblers are eating the icing. I just don’t get it. 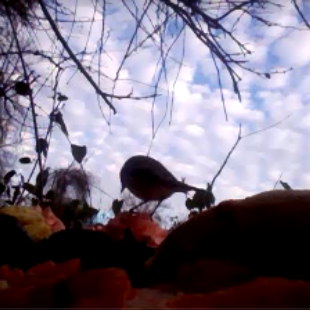 Warblers are very picky on the foods that they eat. I tried putting out carrots and they didn’t eat that. They don’t like meat either. Now, there is a certain bread that they like, particularly the wheat kind. I think they will eat cheese, but I’m not sure. As far as the icing goes, they must be getting it confused with the wax. They seem to like the raspberry icing versus the other icings. They will eat every flavor, but chocolate. They seem to know what is safe for them to eat, based on their colors. Some colors may indicate poison to them. I’m not sure what those colors are, but another YouTube friend named Darian03 told me about that. The cupcakes themselves are being eaten by the Blue-Jays, which are extremely intelligent birds. In fact, did you know that they can mimic human speech? Yes, it’s true, and because they are corvids, just like crows, ravens, and magpies, they will search for whatever food sources are available. Obviously, they are smart enough to be able to survive. They’ll eat a variety of foods, just like us basically. I’m not sure if they eat everything. They aren’t like house sparrows. However, they are migratory birds, so they need to be able to eat whatever they can use all their energy they need. I have a YouTube video that shows a blue jay grabbing a piece of a vanilla cupcake that I crumbled up and then flying away with it. They don’t normally eat them on the spot. They seem to always be flying away. They don’t stay in the same place for a long time like the warblers do. I’ll have other videos of blue-jays eating other foods at some point. Well, let me know if these warblers are like other birds? It seems like lots of birds are curious eaters. What do you think?